The latest DC Universe Animated Original Movie throws Superman and Batman back into the limelight for a friendly team-up affair with plenty of guests. Definitely a lighter tale following the incredibly dark Batman: Under the Red Hood, Superman/Batman: Apocalypse brings back over-the-top theatrics, dramatics and explosions galore. Somewhat sacrificing plot for pretty lights, fans of the original Superman/Batman storyline (of which this movie is based upon) should definitely find plenty to enjoy, both for the eyes and ears. After a spaceship splashes down in Gotham City Harbor, Batman and Superman encounter a mysterious Kryptonian with powers as great as those of the Man of Steel. The Kryptonian is soon revealed to be Kara, cousin of Superman, who takes her under his wing to educate her about the ways of Earth. However, the villainous Darkseid has other plans. Seeing an opportunity to finally defeat Superman, Darkseid abducts and gains control of Kara, utilizing the powerful Kryptonian to do his bidding. It’s up to Batman and Superman to save Kara, but they’ll have to take the fight to Darkseid within his hostile world – where unknown, deadly threats lurk around every corner, including a brainwashed Kryptonian able to match Superman blow-for-blow. Like I said, there’s plenty to enjoy for the eyes and ears here, but I’m sorry to say that your mind may not get that good of a workout with this latest animated effort. Based on the graphic novel Superman/Batman: Supergirl by Jeph Loeb and Michael Turner, the animated feature is a very fair representation of the source material. Dripping with the plot holes and logic leaps we find in the now-standard summer action flick, Superman/Batman: Apocalypse is an over-the-top romp that doesn’t hold back in any regard. Everything is overly dramatic, explosions are massive, slugfests are long and brutal, and Batman is pretty unstoppable and well-prepared for…well…anything. The above synopsis pretty much spells out the story. The plot is light, which should come to no surprise to those who read the original comic book. The movie basically forces itself forward, with characters making decisions purely based around plot points instead of natural occurrences. And given the light plot, the film is significantly padded out with plenty of fight scenes, the majority of which are very beautifully animated. One fight scene in particular featuring Wonder Woman and Big Barda duking it out with the Female Furies, is particularly well-handled from start to end. In fact, there’s one moment in particular, when Wonder Woman uses Lashina’s whip against her that I found to feature some really smoothe, very well-executed animation. You’ll find plenty to ogle at here, but those looking for substance should probably look elsewhere. Now, that’s not a slam against this movie or the original comic book. It seems as though the original scribe, Loeb, wanted to write a big blockbuster and that’s exactly what he does. It’s larger-than-life and full of dramatics. And the script here, adapted by Tab Murphy, is no different. There are plenty of scenes which actually read word from word from the source material. Superman/Batman: Apocalypse slavishly follows the original works here, something that will obviously please countless fans. And, obviously, those who disliked Loeb’s work on Superman/Batman will find very little to change their opinion here. Sure, the animated feature does nicely fix a couple of the source material’s more…questionable decisions, particularly the final battle between Superman and Darkseid, but little else. If you’re looking for this movie to “fix” the original graphic novel, then prepare to be disappointed. It’s also worth noting that Lauren Montgomery’s direction remains spot-on. A cheesecake-y as this movie could have been, she’s able to really restrain a lot of it and actually pay a very respectful tribute to the much beloved Superman/Batman: Supergirl arc by Loeb and the late Michael Turner. And I bet fans’ll get a kick of hearing Kevin Conroy spouting Batman’s dialogue once again, and the original DCAU Superman Tim Daly back as the Man of Steel. Both bring an amazing amount of heft and weight to their respective characters, making pretty stiff dialogue sound a bit more natural. Summer Glau fills the role of Supergirl quite nicely, though from time to time her line readings can come off as a bit cold. The recast that has caused the most commotion among the fans is Andre Braugher as Darkseid and, for the most part, I would agree. I understand why the created team opted to cast Craugher as Darkseid, to bring a sort of elegance to the role, and it does work. I like the idea here, but the execution is a tiny bit lacking. Much like Glau, I found some of his work came off as though he was just reading from the script, lacking any real heft. In fact, there’s even a couple times when Braugher sounds bored. Definitely some mixed results when it comes to the new faces in the feature, but not as detrimental as some has made it out to be. As a follow-up to Superman/Batman: Public Enemies, it works just fine. There’s even a cute reference to that movie during the opening sequence of this one. I suppose, comparing the two, this movie is likely the superior of the two. Superman/Batman: Public Enemies felt overstuffed and incredibly short, jamming too much into a short, short running time. Here, we get kind of the opposite. It’s a light story which at times struggles to fill the 78 minute run time. The climactic fight scene in Smallville between Kara, Superman and Darkseid reeks of time-filler, but it’s thankfully watchable and put together well. Overall, it’s a fun but forgettable affair. The overly dramatic story is pretty fluffy and light, fun but ultimately lacking. The animation is top-notch and the voice acting is solid across the board, save for a couple questionable calls as previously mentioned, so the pros do outweigh the cons here, but barely. To put this feature alongside previous DC Universe Animated Original Movie, this falls somewhere in the middle, though is a noticeable step down from the previous excellent Batman: Under the Red Hood animated feature. 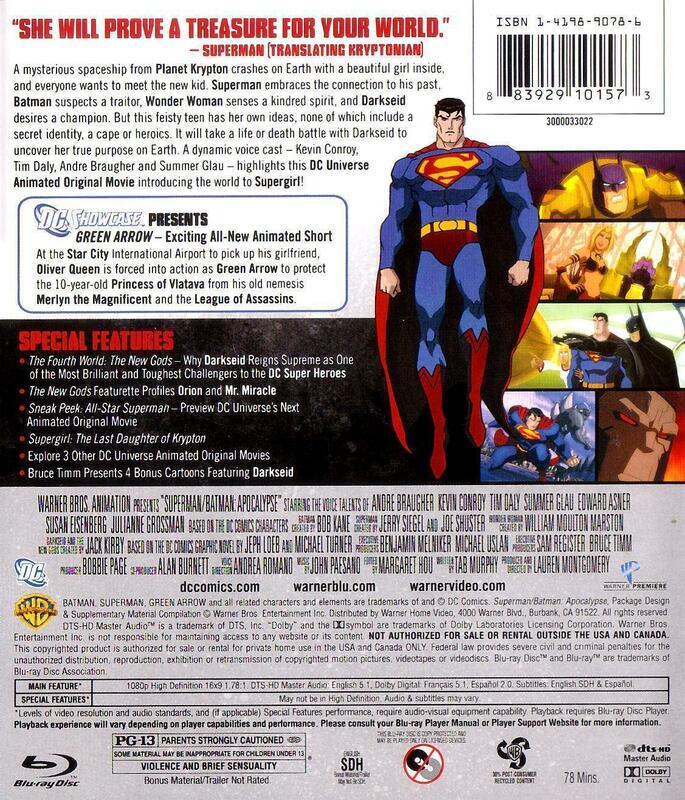 Still, DC Comics fans should definitely seek this out, and I’ll cautiously stamp this feature as Recommended, though many on the fence may want to rent before opting to add Superman/Batman: Apocalypse to one’s collection. Before I go any further, I really feel the need to give Warner Home Video a knock on the noggin’ for trying to sell this movie as something it’s not. This movie is about the origin of Supergirl, but based on all the promotion, ads, even the cover art, etc., I’m sure many would have no idea whatsoever. I understand Warner Home Video is wary of promoting these titles to the female crowd, or even catering to them, but it just seems like a huge opportunity is being missed here by neglecting a major part of the consumer audience. It’s disappointing to see such thinking still being practiced when the female audience makes up a large percentage of the market. A major miss on Warner Home Video’s part. Moving to the actual release, Warner Home Video has served up an adequate overall Blu-ray package. The VC-1 encoded video transfer is pretty spectacular to look at, with barely a visible fault. The clarity is pretty amazing, even with the odd animation trick used to create some hazy or blurring effects. The crispness easily transfers over to the audio work on the title. We get another DTS-HD MA 5.1 audio track (thankfully) and, boy, it sounds so good. The action is loud and hard, with every bit of dialogue, even the odd low volume chattering, coming through as clear as day. Very, very excellent work on the film’s presentation, no question. For the extras, first up is the latest animated short DC Showcase: Green Arrow. Running just over 11 minutes, it plays out like a solid single-issue adventure spotlighting everyone’s favorite emerald archer. The writing by The Spectacular Spider-Man’s Greg Weisman is tight and full of great dialogue, and mixes perfectly with the smooth animation. Another fine installment in the ongoing line of animated shorts, and definitely worth checking out as soon as the main feature wraps up. 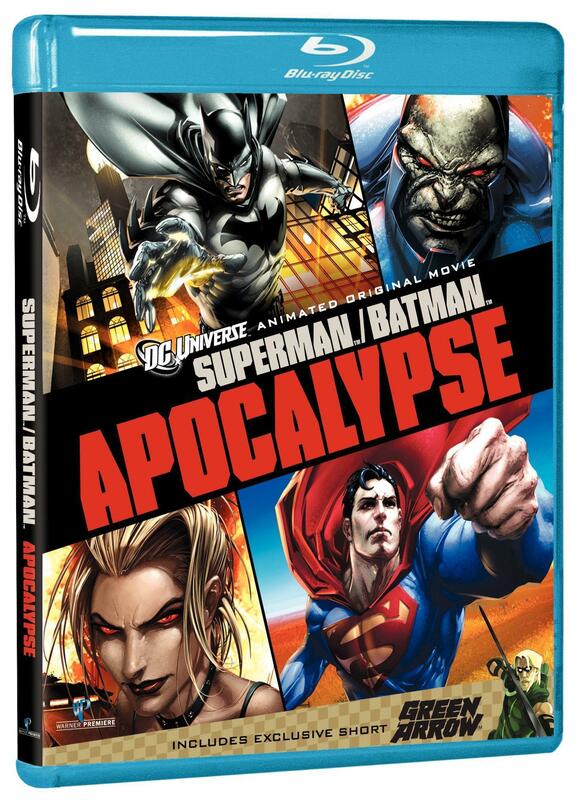 Heck, even if you’re not a fan of the main feature, or have no interest in it, it still may be worth at least renting the DVD release of Superman/Batman: Apocalypse to enjoy this great little diversion. Continuing, we get the standard collection of featurettes and episodes to fill out the disc. It’s a mixed bag, to be honest, with the small collection of new content easily outpaced by the repeated features. Repeated content comes in the form of bonus episodes and a “vintage” Supergirl featurette that came from an earlier Smallville home video release, totaling about 100 minutes. New content runs about 60 minutes in length, shy a few minutes, and it pretty light. Outside of the aforementioned DC Showcase short, we also get a ten minute look at the next DC Universe Animated Original Movie All-Star Superman, a twenty-minute featurette on the classic New Gods characters, and two other five minute featuttes on a couple specific New Gods characters. The three new featurettes focus on the New Gods characters – “The Fourth World: The New Gods,” “New Gods: Mr. Miracle,” “ and “New Gods: Orion” – explaining the comic book origins of these characters and the role they played in past DC Comics series, in the comic book world, and in the Superman/Batman: Apocalypse animated feature. Definitely an informative set of featurettes for both casual viewers and die-hard comic fans. An, aside from the animated short and movie preview, that rounds off the new content for this release. Yup, that’s it. If you are interested in picking up this feature, go with the Blu-ray. Not only is the quality on the main feature far superior than its DVD counterpart, but you’ll get the most bang for your buck here. Superman/Batman: Apocalypse is a fun little diversion that is no more than an average adventure, failing to reach the heights of previous DC Universe Animated Original Movie titles. Maybe it is because Batman: Under the Red Hood was such an excellent, excellent animated feature that this one pales in comparison. To boil it down, if you enjoyed Superman/Batman: Public Enemies, there’s a great chance you’ll enjoy this one. And on top of that, picking up the Blu-ray edition of this title is the way to go. 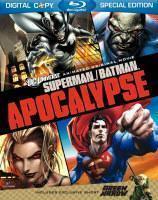 Superman/Batman: Apocalypse comes Recommended. 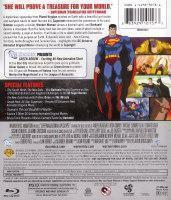 Superman/Batman: Apocalypse is now available to own on Blu-ray and DVD. More Superman/Batman: Apocalypse content and details can be found at The World’s Finest.